Home » Press » Events » 2018 Financial Secrecy Index Launch: How Opaque Is The United States? How Opaque Is the United States? In identifying the providers of international financial secrecy, the Financial Secrecy Index (FSI) — updated now for the first time since 2015 — reveals that the traditional stereotype of tax havens is misconceived. The world’s most important providers of financial secrecy are not small, palm-fringed islands as many suppose, but some of the world’s biggest and wealthiest countries — including the United States. The implications for global power politics are clearly enormous, and help explain why widely heralded international efforts to crack down on tax havens and financial secrecy have been rather ineffective, despite many fine words from G20 and OECD countries: for it is these countries — which receive these gigantic inflows — that set the rules of the game. The United States is the world’s largest economy and its main financial center in Wall Street is, on some measures, the world’s biggest. It provides secrecy for non-residents, both at a Federal level and at the level of individual U.S. states. 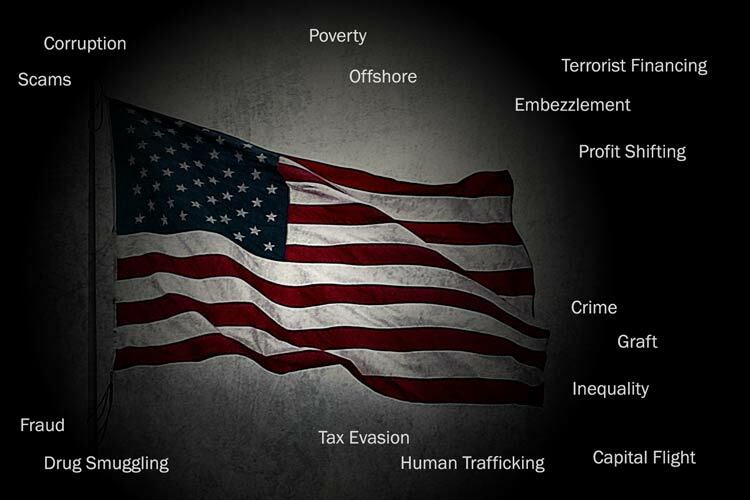 Taken as a whole, the United States provides a very wide range of offshore secrecy services, which led it to rank highly in previous editions of the FSI (most recently, the U.S. was ranked as the 3rd biggest secrecy jurisdiction in the 2015 Index). Gaps in U.S. money laundering laws allow U.S. financial institutions to handle the proceeds of a long list of crimes, as long as those crimes are committed outside the U.S. A significant share of U.S. residential and commercial property is owned by offshore shell companies, under secrecy arrangements that help non-resident foreigners earn income that can be kept secret from the tax and criminal authorities of their home country. The only realistic way to address these problems comprehensively is to tackle them at the root: by directly confronting offshore secrecy and the global infrastructure that creates it. A first step towards this goal is to identify as accurately as possible the jurisdictions that make it their business to provide offshore secrecy. This is what the FSI does. It is the product of years of detailed research by a dedicated team, and there is nothing else like it out there. On January 30th, the Tax Justice Network (a FACT Coalition member) will launch the 2018 Financial Secrecy Index, a survey of global financial secrecy. This unique index combines a secrecy score with a weighting to create a ranking of the secrecy jurisdictions and countries that most actively promote secrecy in global finance. The FACT Coalition—in collaboration with Transparency International—will host the U.S. launch of the Index, featuring a presentation from one of the Index’s lead authors, TJN’s Andres Knobel. A panel of experts will delve deeper into the issue’s impacts in the U.S. and abroad, particularly in the wake of the recent U.S. tax overhaul, and suggest policy remedies. The last time the Index was launched, in November 2015, the United States was ranked the 3rd largest secrecy jurisdiction. Come find out what, if anything, has changed. The briefing is Tuesday, January 30th, 2018 from 12:00 pm to 1:30 pm EST in the Wellstone Room at The FACT Coalition offices (located inside of EPI). This event is open to the press, and media are strongly encouraged to attend. The 2018 Financial Secrecy Index is strictly embargoed until Tuesday, January 30th at 12:00 pm EST / 5:00 pm GMT (London). Embargoed materials are available for accredited journalists in advance. Please direct all press inquiries about the event, and all requests for embargoed materials to Clark Gascoigne by email at cgascoigne@nullthefactcoalition.org or by phone at +1 (202) 810-1334.